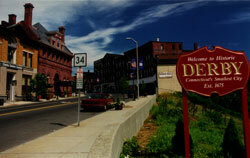 Hubbell Bros., Connecticut's oldest shoe store, established in 1896, is on the right, at 284 Main Street. 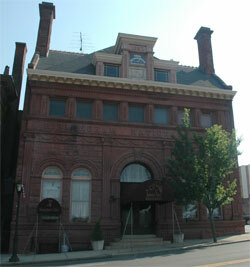 The building, constructed about 1880, was formerly occupied by F.W. Curtiss butcher shop. 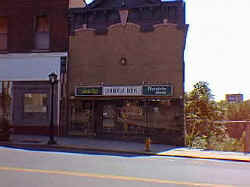 Hubbell Bros. moved to a new home on Pershing Drive in Derby on October 4, 2004, and the building has since been demolished. 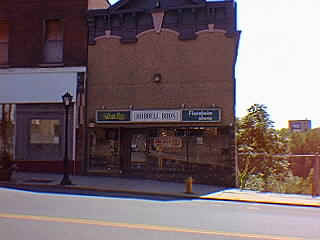 Hubbell's closed for good in 2010! 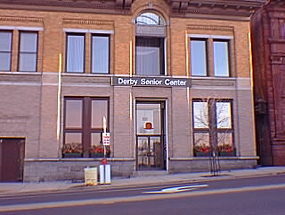 The present Derby Senior Center at 293-295 Main Street was formerly the home of the Home Trust Company, which constructed this building in 1901, with an addition constructed in 1922. Its charter was one of the broadest of any trust company in Connecticut, but it limited its concerns to savings, real estate management, insurance and trusts. In the early 1970s, the Home Trust merged with Birmingham National Bank and Second National Bank to become the Second New Haven Bank, and moved to Thompson Place. At 285 Main Street, the former Birmingham National Bank, constructed in 1892, was the first building in the banking district arising in prosperous early twentieth century Derby. It was chartered in 1848 with the title Manufacturers Bank of Birmingham, and in 1865 became part of the national banking system as The Birmingham National Bank. Its original capital stock equaled $100,000, and included prominent manufacturers in Derby. Edward N. Shelton was the first president. This exceptional building was constructed as a monument, richly detailed with Sullivanesque and Neo-Greek elements. Take a left at the traffic light onto Elizabeth Street.